The film is set during Greece’s War for Independence, in which the locals rose up after 400 years of oppressive rule by the Ottoman Turks and gained their freedom. The film’s (fictional) plot centers on a village girl, Anna Christina (Tania Raymonde), the sole survivor of a massacre, who grows up to lead her people in the 1821 rebellion. Though embittered by the brutality of her enemy, she also recalls the young Turkish officer who spared her life as a child, and when she meets him again as a young adult, comes to realize the humanity that exists within all of us. The film stars Oscar winner Christopher Plummer (“Beginners”), Tony winner Patti LuPone (“Evita”) and Screen Actors Guild nominee Billy Zane (“Titanic”), alongside up-and-coming stars Tania Raymonde, Jan Uddin and Raza Jaffrey. Besides Zane, the film also showcases several actors of Greek descent including Simon Kassianides and Costas Mandylor. Ling co-wrote the screenplay with producer Marianne Metropoulos, based on her story, “Daughter of Destiny,” and Kevin Bernhardt. Ling spoke about helming his first feature film and the ageless themes sewed into “Cliffs of Freedom,” namely home, love and sacrifice, as well as the timely narrative about a young woman’s struggle to overcome male-dominant oppression and having the courage to forge her own destiny. Q: Could you tell me how long and why directing a feature film has been a goal for you? 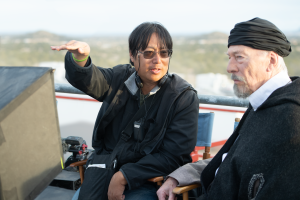 Ling: I grew up on movies and had the opportunity to get my education at both the USC Cinema School and in the trenches of production starting in the late 1980s, so I’ve always wanted to try my hand at directing. As you can imagine, film school doesn’t exactly give you the ambition to be just a production assistant. It teaches you how to do everything and understand every department, so that you can either find a specialty you want to focus on, or give you the overview of the whole process that makes you want to be a director. I would always joke that by giving you an understanding of every aspect of the process, film school makes you qualified to either be a director, or a P.A. Q: What did you learn storytelling-wise from working with James Cameron on “The Abyss,” “Terminator 2,” “Titanic” and other filmmakers you’ve worked with? Ling: I learned so much from James Cameron about filmmaking, storytelling, the need to fight for your vision and how it’s a never-ending battle and a huge responsibility to tell a compelling story with relatable characters. Some people talk about how challenging he is to work with, but what’s true about that is simply that he challenges everyone on his team to care about the project as much as he does, and to take the responsibility of doing your job seriously. In my experience, he will never ask anyone to do anything he is not willing or able to do, and the challenge there is that he can do almost every job on a film as well or better than anyone. Q: Could you talk about casting the film? Ling: We made a decision early on to try to make this an American Hollywood film that was accessible to mainstream domestic audiences, so we cast both Greeks and non-Greek actors, and tied it all together with a light British accent. We went for some relative unknowns for our leads and backed them up with some powerhouse supporting players. Tania had a striking look and a rebellious streak that stood out to me since even before I saw her in “Lost.” I had worked with Jan Uddin on a prior small project where he brought a regal kindness and a lot of soul, while looking great on camera; and Raza Jaffrey was amazing in dedicating himself not only to the villainy of the part, but to mine the deeper emotional core that justified the character. Billy Zane –who is Greek—did much the same thing, and was always looking for the human foibles under what could easily be a stock character. I’ve been a fan of Patti LuPone since “Evita” on Broadway in 1980, and I am still humbled that Christopher Plummer liked the part enough to be willing to work with a first-time director. They both brought gravitas to the film and yet were wonderfully fun to work with; their sense of humor, perspective and trust in me really helped keep me going. Q: Political tensions between Greece and Turkey remain strained to this day. How do you think this film will go over in those countries? Do you think they will achieve peace? Ling: There are those who will view this admittedly-fictional film as intended, where we tried to depict a relatable story about how love can be the first bridge to understanding between cultures … but as the financiers of this film are Greek and wanted to emphasize a sense of patriotism and honor for their culture, there is of course a bit of a bias towards the Greek viewpoint. But we wanted to make sure that not all Greeks were portrayed as saints and not all Turks were depicted as the bad guys, and that even the most dangerous Turk, Sunal, had personal demons and was essentially motivated by love and honor for his brother-in-arms. I know that there will be some hardline Greeks and Turks who will dogmatically view the film as untrue to their view of themselves and their culture, but I hope that people who prefer to look for those aspects which unite cultures rather than divide them will find meaning in it. It is these kinds of people in both countries, the ones who see no offense in a love story between a Greek and a Turk, who would be the best chance for these countries to find peace. Q: What was the biggest technical challenge of making this film? Ling: As with many independent films like ours, time and resources are the biggest challenges; we had to find a way to show some battle sequences and a period that no longer exists, and to do so with a short schedule and tight budget on location in New Mexico … which is naturally the first place in the U.S. that you think of when you think of Greece. We had hundreds of extras on some days, which meant hundreds of costumes and weapons. We had a lot of functioning flintlock rifles and pistols, and it was a logistical challenge like I had never dealt with directly before. Creatively, the challenge was not only to show the chaos of a major historical battle with only a fraction of the real armies, but to choreograph the action clearly so that it was historically accurate in behavior and tactics with these older weapons, because how we are used to seeing big battles with guns today is totally not the same as they would have done in 1821. The pistols and rifles had no rifling, which means they were wildly inaccurate for the most part beyond a short range, and they were single shot weapons that had to be reloaded after every shot. This changed the battle tactics drastically on both sides, and we had to figure out how to depict that in a way that made sense to modern audiences in the moment. But we had a great stunt team led by Terry Leonard of “Raiders of the Lost Ark” fame. He and his son, Matt, worked with us and the weapons team to make it as authentic as we could, and then try to augment it with visual effects as necessary. Q: What classic historic epics influenced you on this? Ling: The film was certainly influenced by films like “Braveheart,” “Dr. Zhivago,” and “Lawrence of Arabia,” so we were aiming high. There is a lot of passion and heightened emotion in the Greek culture, and as a director it was incumbent upon me to capture that spirit by embracing it and lean into the epic melodrama of it all. Q: What ideas do you want audiences to take away from the film? Ling: As a non-Greek, I was always looking for a way to make the story and history and culture as accessible to mainstream audiences as I could, while trying to stay authentic to the spirit of Greece as they saw themselves. At the same time, I am proud to have tried to depict a strong female heroine within a patriarchal cultural setting, who in being forced to redefine herself, she also helps others define themselves. I hope that modern audiences can see themselves in some of these characters and can relate to the common humanity that can exist between nations. That love can be a bridge to begin understanding, that family, honor, sacrifice and selflessness are not exclusive to any one culture, and that even one person can make a difference through the deeds and choices they make. In advance of Greek Independence Day (March 25), “Cliffs of Freedom” opens in theaters in New York and Los Angeles on Friday March 1 and expands to more theaters and markets on March 8 and 15. Previous PostPhotos: ‘Little Mermaid,’ ‘Mystery Road,’ More on Home Entertainment … Plus a Giveaway!! !